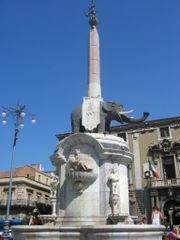 Catania is the second-largest city of Sicily, southern Italy, and is the capital of the province which bears its name. With some 306,000 inhabitants (750,000 in the metropolitan area) it has the second highest population density on the island. The city's patron saint is Saint Agatha. Catania is located on the east coast of the island, half way between Messina and Siracusa and is at the foot of the active volcano Mount Etna. It was founded in the 8th century BC by Greek colonizers from Chalcis in Euboea led by Euarchos. It was extensively destroyed by earthquakes in 1169 and 1693 and by lava flows which ran over and around it into the sea. The first Sicilian university was founded there in 1434. The city has been buried by lava a total of seven times in recorded history, and in layers under the present day city are the Roman city that preceded it, and the Greek city before that. Many of the ancient monuments of the Roman city have been destroyed by the numerous earthquakes. Currently, remains of the following buildings can be seen: The Theater (2nd century), The Amphitheater (2nd century), The Odeon (3rd century CE). Located in the centre of the lively city of Catania, the Excelsior Grand Hotel is a modern and efficient hotel, placed stone's throw from the natural scenery of Etna. The hotel is the ideal destination for both the business traveller, arriving for meeting or conferences, and tourists who demand the highest levels of sophisticated comfort. The hotel has 176 elegantly furnished and modern equipped rooms that are all sound insulated and fitted with lass windows, large and comfortable bathrooms so to offer you the highest comfort. The creative, high-level cuisine features authentic regional flavours and is very attentive to products from rich and generous soil. You can also chill out with a fine drink at the cocktail bar after a weary day. The hotel provides fully equipped gymnasium for health conscious guests. This refined property in a quiet area close to the sea, offers elegant accommodation and modern facilities to make your stay in Catania a pleasant one. 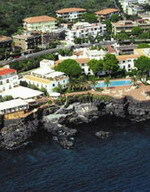 The Grand Hotel Baia Verde, situated on the cliffs close to Catania, enjoys this particular location in the enchanting scenery of the lonian coast, behind which the volcano Etna raises its mighty size. The hotel boasts 162 air-conditioned bedrooms that are comfortable and well-maintained. The on site restaurant provides several types of service in various places and, during summer, on the terrace facing the sea. In addition, the piano bar waits for you every evening, with fine drink and pleasant music. Along with comfortable accommodation, the Nettuno Hotel provides quality service to make your stay in Catania a pleasant one. Situated just 600 metres from the historic centre, the property is surrounded by the splendid bay of Catania, Mount Etna and the black volcanic rocks. The hotel boasts 101 comfortable guestrooms, including two suites, which are pleasantly decorated and provided with numerous in-room amenities. Guests can enjoy dining at the onsite Bacco Restaurant that serves a variety of delicacies and later relax with a sip of their favourite drink at the in-house cocktail bar. During leisure, guests can take a refreshing dip in the pool or explore the nearby attractions. A place in which to work and enjoy, Romano Palace is designed for comfort and relaxation, equipped with every imaginable detail. The Romano Palace Luxury Hotel is located directly opposite to the famous La Playa beach of Catania away from the chaotic city centre. The hotel has easy access to the Playa Park, which has its own small salted lake, a riding school and jogging tracks. This property features 104 guestrooms including suites, which are well furnished and come with a host of modern amenities. The hotel features 2 restaurants, one overlooking the park and the sea serves delicious menu, while the other offers a la carte dishes. During leisure, you can simply laze around the swimming pool, relax at the sauna or workout at the onsite fitness centre.The hotel also provides a private park with a Mediterranean grove. Featuring an elegant decor and a warm hospitality, Sheraton Hotel Catania, right on the beachfront welcomes you for an unforgettable vacation. 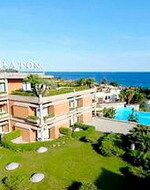 The Sheraton Catania Hotel is an elegant resort located on the Cyclops Coast, directly across the street from the beach and just 2 miles from the centre of Catania. The Museo Bellini, Museo Verga, Acireale and Mt. Etna are some of the local attractions. 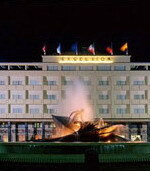 The hotel has built a global reputation by providing a beautiful and convenient facility with an elite staff that anticipates and fulfills guests' every need. The comfortable guestrooms are furnished with numerous standard amenities, including a balcony. Guests can dine at the onsite restaurant that serves a wide range of Mediterranean dishes in a calm atmosphere overlooking the ocean. The Sheraton's pool and fitness facilities are also ideal when it's time to unwind. A unique structure for character and atmosphere, the Villa del Bosco VdB Next Hotel symbolises the perfect blending between the opulent luxury of an old 19th century house and the more up-to-date area combining every comfort and exclusive design. Next to the historical and commercial centre of the city, the hotel is situated in a very exclusive residential area. Formerly one of Catania's elegant aristocratic homes, the property now displays the splendid grandeur and charm of ancient Catania. The hotel boasts spacious guestrooms and suites that combine elegance and class with the most exclusive and modern comforts. All the 52 rooms feature hydro massage tubs or showers, LCD television and wi-fi internet access. 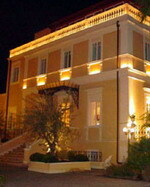 The onsite restaurant provides a most elegant and romantic atmosphere with a wide range of Sicilian and Italian dishes. Mount Etna (also known as Mongibeddu in Sicilian and Mongibello in Italian, a combination of Latin mont- and Arabic jebel, both meaning mountain) is an active volcano on the east coast of Sicily, close to Messina and Catania. It is the largest active volcano in Europe, currently standing about 3,326 m (10,910 ft) high, though it should be noted that this varies with summit eruptions; the mountain is 21.6 m (71 ft) lower now than it was in 1865. It is the highest mountain in Italy south of the Alps. Etna covers an area of 1190 km² (460 square miles) with a basal circumference of 140 km. This makes it by far the largest of the three active volcanoes in Italy, being nearly three times the height of the next largest, Mount Vesuvius. 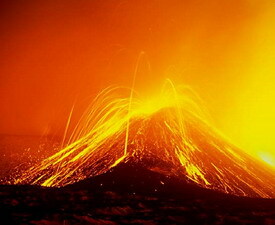 Mount Etna is one of the most active volcanoes in the world and is in an almost constant state of eruption. Although it can occasionally be very destructive, it is not generally regarded as being particularly dangerous, and thousands of people live on its slopes and in the surrounding areas. The fertile volcanic soils support extensive agriculture, with vineyards and orchards spread across the lower slopes of the mountain and the broad Plain of Catania to the south. Due to its history of recent activity and nearby population, Mount Etna has been designated a Decade Volcano by the United Nations.